East Asian Legal Studies is the United States’ oldest and most extensive academic program devoted to the study of the law and legal history of the nations and peoples of East Asia and their interaction with the United States. The program was created in 1965 in response to increasing interest among lawyers and scholars of international and comparative law in the legal cultures of China, Japan, Korea, and Southeast Asia. The Law School offers instruction on the legal systems of East Asia and sponsors in-depth research conducted by scholars in residence. Joint programs of study can also be arranged on an individual basis with other parts of Harvard University. An active extracurricular program includes a lunchtime speaker series that combines lectures and discussions on Asian legal themes in an informal setting, a workshop series providing a more formal setting for the presentation of research projects, and foreign language discussion groups on legal issues. EALS is directed by William P. Alford and guided by a faculty advisory committee comprised of Professor Alford and Professors Mark Ramseyer and Mark Wu and is funded by independent grants and charitable contributions. For upcoming EALS Events, please see the Events page. To join the EALS events mailing list, send a blank email to eals@law.harvard.edu with the word SUBSCRIBE in the subject line. 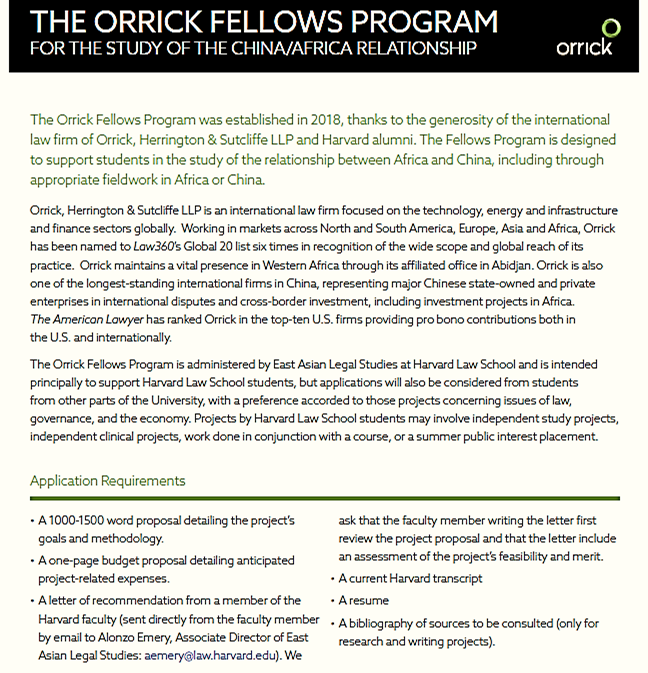 The Orrick Fellows Program was established in 2018, thanks to the generosity of the international law firm of Orrick, Herrington & Sutcliffe LLP and Harvard alumni. The Fellows Program is designed to support students in the study of the relationship between Africa and China, including through appropriate fieldwork in Africa or China. Orrick, Herrington & Sutcliffe LLP is an international law firm focused on the technology, energy and infrastructure and finance sectors globally. Working in markets across North and South America, Europe, Asia and Africa, Orrick has been named to Law360’s Global 20 list six times in recognition of the wide scope and global reach of its practice. Orrick maintains a vital presence in Western Africa through its affiliated office in Abidjan. Orrick is also one of the longest-standing international firms in China, representing major Chinese state-owned and private enterprises in international disputes and cross-border investment, including investment projects in Africa. The American Lawyer has ranked Orrick in the top-ten U.S. firms providing pro bono contributions both in the U.S. and internationally. The Orrick Fellows Program is administered by East Asian Legal Studies at Harvard Law School and is intended principally to support Harvard Law School students, but applications will also be considered from students from other parts of the University, with a preference accorded to those projects concerning issues of law, governance, and the economy. Projects by Harvard Law School students may involve independent study projects, independent clinical projects, work done in conjunction with a course, or a summer public interest placement. a 1000-1500 word proposal detailing the project’s goals and methodology. a one-page budget proposal detailing anticipated project-related expenses. a letter of recommendation from a member of the Harvard faculty (sent directly from the faculty member by email to Alonzo Emery, Associate Director of East Asian Legal Studies: aemery@law.harvard.edu). We ask that the faculty member writing the letter first review the project proposal and that the letter include an assessment of the project’s feasibility and merit. a bibliography of sources to be consulted (only for research and writing projects). In exceptional cases, funding may also be available at other times or granted for group projects. Students with exceptional circumstances should address their inquiries to Alonzo Emery, Associate Director of East Asian Legal Studies (aemery@law.harvard.edu). Use of Human Subjects-- If research involves human subjects or obtaining identifiable data about them, then it must be submitted to the Committee on the Use of Human Subjects. Please review the information on the CUHS website for guidance and contact them directly by email with any questions: cuhs@fas.harvard.edu. Reporting Requirements-- Within 30 days of completing their fellowships, Orrick Fellows must submit a 1000-1500 word final report about what they achieved during the fellowship term. In addition to describing what they learned, Fellows should use the final report as an opportunity to describe how insights gained from the project will contribute to their ongoing academic and professional growth. Orrick Fellows must submit scanned copies of all project-related receipts along with the final written report to Alonzo Emery, Associate Director of East Asian Legal Studies. 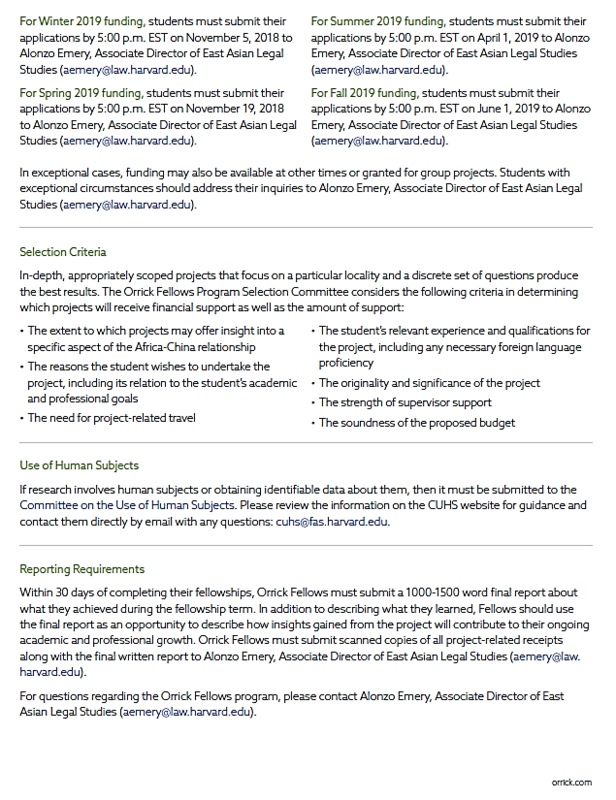 For questions regarding the Orrick Fellows program, please contact Alonzo Emery, Associate Director of East Asian Legal Studies (aemery@law.harvard.edu). Mailing Address: EALS, Austin Hall 301, Harvard Law School, 1585 Massachusetts Avenue, Cambridge, MA 02138. Last modified April 4, 2019 by Emma Johnson. ©2002 President and Fellows of Harvard College. All rights reserved. Assistive technology on this site is optimized for the Chrome browser.